The technology that lets you finally think out of the box . . .
Fine needle aspiration biopsy (FNAB, FNA or NAB), or fine-needle aspiration cytology (FNAC), is a diagnostic procedure used to investigate superficial (just under the skin) lumps or masses. 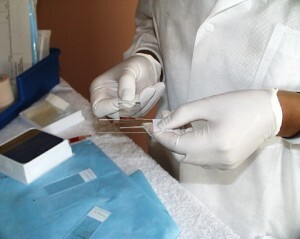 In this technique, a thin, hollow needle is inserted into the mass for sampling of cells that, after being stained, will be examined under a microscope. Fine-needle aspiration biopsies are minor surgical procedures. Today, this procedure is widely used in the diagnosis of cancer and the need to communicate results quickly is one way to use RTIS™ effectively. A fine needle aspiration biopsy is safer and less traumatic than an open surgical biopsy, and significant complications are usually rare, depending on the body site. There is a risk, because the biopsy is very small (only a few cells), that the problematic cells will be missed, resulting in a false negative result. There is also a risk that the cells taken will not enable a definitive diagnosis. The need to eliminate the time transfer of actual sample slides can be accomplished using the RTIS™ to share results instantaneously. RTIS™ allows you to share instantaneously!